For all the entrepreneurs working on some startup idea and looking for any investor, Momentum 2017 is the right platform for them. 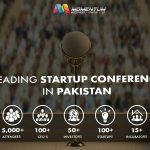 Momentum 2017 is the leading technology startup conference which took place on 6th and 7th of February at Expo Center Karachi. Momentum gathered investors, business leaders, tech executives, speakers, and academia who took the stage to share their stories. The stage was purely dedicated for pitching. 20 startups were selected by the mentors who gave a pitch to the jury and a vast audience. 3 of them were selected for the final round which competed for ‘Winner of the Pitch at Momentum 2017’ title and were awarded the prize money of PKR 1 million, 0.7 million and 0.3 million on securing first, second and third position respectively. The conference proved beneficial for both entrepreneurs and investors equally. The entrepreneurs got a chance of displaying their underdeveloped prototypes and investors got a fair idea about the right area to invest. The mentoring sessions were conducted by 100+ CEOs of SME and top notch companies. People from academia including LUMS, IBA, PAF KIET, NUST, COMSATS and DIHE and people from incubation centers including Plan 9, Aman Tech, BIC and others became a part of this event. The strategic partners for the conference were top IT companies including IBM, Microsoft, Pakistan software house association ([email protected]), Amazon web services, government bodies such as Security & Exchange commission of Pakistan (SECP) and Pakistan Telecom Authority (PTA). Such a huge gathering of people created a first ever platform for the brightest minds of Pakistan. Co-founder and CEO of SocialChamp, Sameer Ahmed Khan, became the winner of Momentum Startup Pitch competition while two Plan9 startups namely Nearpeer and CampusFeed were succeeded in bagging second and third position respectively.